At present, there is quantity of comfortable tools for the creation of visualization projects that allow you to create very fancy user interface with animated visuals, lots of different types of charts and stationery. All, however, have one common drawback – you need to learn to work with them really perfectly. Otherwise, the end result will not meet the possibilities they provide. Real requirements for visualization are often not so high that it makes sense to devote time to learn perfect working with mentioned comfortable visualization tools. A worker at the test facility or in the control room does not need to watch the spectacular images and animations. After some time look at this beautiful picture ceases to be interesting for him. What he really needs is to see data, even if only in the form of characters, that are appropriately structured and thus provide the possibility of very rapid orientate in them. Placement of data points – the most important data from a single plant can be placed in one branch and every plant can have its own branch. Data from the same types of equipment can be placed in one branch of the tree. The current data may be in a different branch as data about history of the data points. Another universal view of data is tabular display. Groups of somehow interrelated data are placed in a row of the table. Individual rows of the table may represent the same view on data points (e.g. values ​​of operating parameters of any technological device) at different time points. The tabular views of data can be created simply by using SQL commands. These SQL commands may be predefined and stored in the configuration (to avoid unduly burden for the ordinary users), or may be created or just modified from predefined SQL commands stored directly in visualization application. Figure 1 Combination of tree view and table view to current data. Figure 2 Table view of data from a database gained with modifiable SQL command. The use of these two methods of visualization – the tree view and tabular view provides a way of really universal visualizing without need to configure visualization itself. These universal visualization principles were used in the software product SAEAUT SCADA™. This product represents a pair of two basic applications – server application that provides collection, data processing, and storing them in databases and the Web client application that provides visualization of the data from the server using the above described two ways to display – a tree data structure and tabular display of data. Collection, processing and storage of data by the server is necessary to configure (customize) for different applications. In SAEAUT SCADA™ it is done using comfortable configuration application. However, the data visualization itself, by utilizing the above described universal ways of data visualizing, there is no need to configure. Visualization application uses data from the configuration of the server application. View of current data from devices or from other external applications or data obtained by internal processing algorithms in the server of SAEAUT SCADA. For this, it uses a combination of tree and tabular views. The table displays data from one branch of the tree structure. For each data point shows not only the current value but also quality and timestamp – i.e. whether the data is valid. This way you can not only view data but also write them and so to manage devices connected to the server. View data stored in databases using table views – by that database tables from one or more connected databases contained within server configuration can be shown immediately without user intervention. Just select table from the list of available tables to see it. Preconfigured SQL commands, to show table can be modified by user and saved for later use. You can create and save even more complex SQL commands to create data view from multiple tables on one database. Create interactive reports (ad-hoc) with formats csv, pdf, xml, xls and doc from the current data tables and from data stored in databases connected to server application. Displaying of current status and alarm history – the operator can not only view and filter alarms resources by various criteria, but they also acknowledge an alarm and comment it. View the contents of log files generated by the server application . Records of server functionality is saved to log file. Detail of the system records can be configured in advance or be influenced by operators on the fly . In addition, you can also configure creating new log files and storing the current values ​​of process variables together with a commentary to them. Responsive web design ensures the correct display of data in various web browsers on desktop and mobile devices. Of course, the need for a graphical display of data is sometimes unavoidable e.g. to view current or historical trend in the form of a graph. This is also possible to provide easily without demanding visualization applications in several ways. E.g. 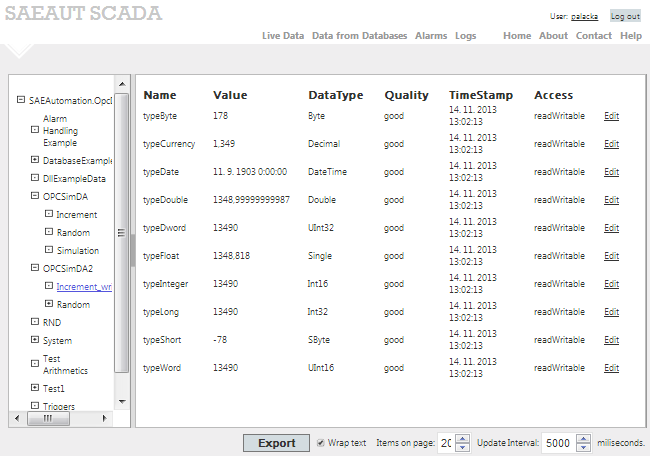 , our application OPCAdapter allows within a few minutes to configure graph view of current data trends from SAEAUT SCADA server. Very rich visualization possibilities are offered by the Microsoft Excel, which can be connected the SAEAUT SCADA server in several different ways.